The Dreifaltigkeitskirche or Church of the Holy Trinity in the 8th district of Vienna (Josefstadt) is an early-Baroque church generally neglected by tourists. It was built by the "Trinitarian Order", a monastic order that worked towards the liberation of Christians in (usually Muslim) captivity. They were founded near Paris in 1198 and came to Vienna in 1688, five years after the defeat of the Turkish army in the Second Siege of Vienna. Warfare with the Turks continued until well into the 18th century, so Vienna certainly was a useful base for the Trinitarians. The order built a small chapel in a suburb that is now part of the Josefstadt district - it was opened in 1689, but soon it was too small because many locals attended mass with the monks. The chapel was extended and became a church with three altars and a wooden tower - and in the following year, the Trinitarians started to build a monastery in addition to the church. When the monastery was opened in 1694, there was also a need for an even bigger and more elaborate church. Emperor Leopold I officially opened the construction work for a church in 1695. The construction took seven years and the Dreifaltigkeitskirche was opened in 1702. With the dissolution of "non-practical" orders under the rule of Emperor Joseph II, the Trinitarians were dissolved in 1783. Instead of the Trinitarians, the Minorites - once grown to a powerful order in the course of the counter-reformation and educational measures - moved in at the monastery and Dreifaltigkeitskirche. The Minorites had previously occupied only the Minoritenkirche in the first district, now they carried all sorts of fancy monastic artwork to the Dreifaltigkeitskirche. With this move, the Church of the Holy Trinity was made a parish church - which it still is. In 1827, the dead body of Ludwig van Beethoven was laid here, commemorated by a memorial plate at the front of the church. In 1828, the Dreifaltigkeitskirche got new bells - and Franz Schubert composed the anthem "Glaube, Liebe, Hoffnung" ("Faith, Love, Hope") upon this occasion (another memorial plate for that one). The Dreifaltigkeitskirche is considered to be an example for early Baroque architecture in Vienna - however, it looks like it was built much later than it actually was. At the time of its construction, the Dreifaltigkeitskirche was state-of-the-art and the first church of its kind with round façade elements in Vienna. There is the twin-tower that is typical for large Baroque churches. The interiors are a mix-and-match of artworks by Trinitarians, Minorites and later additions - try to spot some displays of the Holy Trinity. 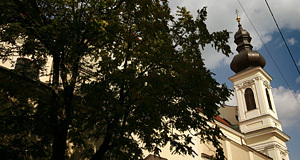 The Trinitarians, by the way, were re-founded in Austria in 1900 and have to "branches", one in Vienna and one in Mödling. Attractions nearby are numerous: Apart from being in the middle of a nice neighbourhood, the Dreifaltigkeitskirche is also in walking distance to the Votivkirche, the Main University and Rathaus City Hall - all on Ringstraße. Close are also the Altes AKH and the AKH General Hospital. For a "study" on the next step in architectural history, go to the nearby Piaristenkirche church by Lukas von Hildebrandt in late Baroque / Rococo.